An afternoon visit to go on the Great Orme Tramway in Llandudno, North Wales. The tram at Victoria Station was broken down, so they had a shuttle bus that takes you up to the Halfway Station (later back down). The Great Orme Tramway (Welsh: Tramffordd y Gogarth) is a cable-hauled 3 ft 6 in (1,067 mm) gauge tramway in Llandudno in north Wales. Open seasonally from late March to late October, it takes over 200,000 passengers each year from Llandudno Victoria Station to just below the summit of the Great Orme headland. From 1932 onwards it was known as the Great Orme Railway, reverting to its original name in 1977. It is Great Britain's only remaining cable-operated street tramway, and one of only a few surviving in the world, and it is owned by Conwy County Borough Council. The line comprises two sections, where each section is an independent funicular and passengers change cars at the halfway station. Whilst the upper section runs on its own right of way and is very similar to many other funicular lines, the lower section is an unusual street-running funicular. Whilst the street running section resembles the better-known San Francisco cable cars, its operation is quite different in that it adheres to the funicular principle where the cars are permanently fixed to the cable and are stopped and started by stopping and starting the cable, unlike San Francisco where cars attach to, and detach from, a continuously running cable. As such, this section's closest relatives are Lisbon’s Glória, Bica, and Lavra street funiculars. Authority to build the tramway was granted by the Great Orme Tramways Act of 1898, and construction started in 1901. The tramway was opened in its two stages: the lower section on 31 July 1902 and the upper on 8 July 1903. The original power house, at the Halfway station between the lower and upper sections, was equipped with winding gear powered by steam from coke-fired boilers. Communication between the power house and the tram cars was provided by a telegraph system, operating over an overhead wire and trolley poles on the cars. The line was initially provided with seven cars, three freight cars numbered 1 to 3 and four passenger cars numbered 4 to 7. The passenger cars were each named after a local Welsh Christian saint and are still in service. The freight cars were for the carriage of goods and parcels, as stipulated in the tramway's original Parliamentary Order, but were withdrawn from service by 1911. The freight vans were also used to carry coffins for burial at the church on Great Orme. There were two methods of using the freight tramcars - they could be placed on the track ahead of a passenger tram, and propelled up the incline, or the cable could be detached from a passenger tram and attached instead to a freight tram, which then operated alone up the incline. All seven trams were fitted with couplings, which would have allowed the passenger trams to tow the freight trams, but there is no evidence that this type of operation ever actually occurred. 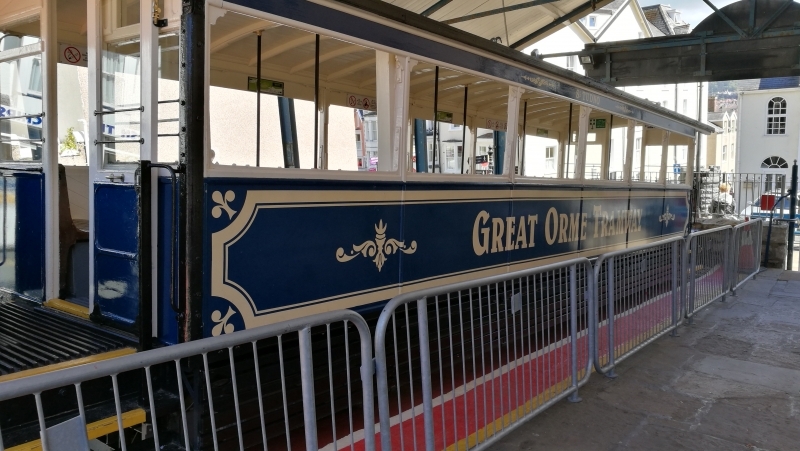 The line suffered a serious accident and consequent financial difficulties in the 1930s, resulting in its sale in 1935 to the Great Orme Railway company. In 1949, Llandudno Urban District Council exercised its power, granted by the original act of parliament, to buy the line. Ownership of the line has since passed to Aberconwy Borough Council and then Conwy County Borough Council as a result of local government reorganisations. The original steam power was replaced in 1958 by electrically powered apparatus. In 1977, the line reverted to the Great Orme Tramway name that it had carried prior to its sale in 1935. Between 1999 and 2001, the line received £1 million of funding from the European Union, together with a further £1 million from the Heritage Lottery Fund and matching funds from its owner. As a result, in 2001, the entire Halfway station, its control room and its power plant were completely rebuilt and re-equipped. At the same time the overhead wire telegraph communication system was replaced with an induction-loop system.